Disclaimer: I work for BeLiteWeight but I'm doing a testimonial because I had surgery, lost weight and was pleased with the care I received at the hospital etc. 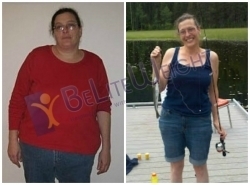 I had revision of my prior Lap Band surgery to a Mini Gastric Bypass on January 29, 2009. I had lost close to 90 pounds with my band* but after some other health issues (not band related) I found myself all the way back up to within 5 pounds of where I started originally back in 2003. I couldn't live heavy any longer and found that I was missing so many vital things in my life like enjoying activities with my children. I wasn't looking forward to another surgery (I'm a surgery whimp) but I didn't see many other options since I was a total failure at dieting (obviously). My revision surgery went well, I won't go into the fact that I think that all the surgeons we have are awesome but I wanted to tell you my experience with losing the weight. Having weight loss surgery was one of the very best decisions I have ever made in my life. I was a relatively "heathy fat person" so, other than having no energy, being heavy robbed me of more of my "life experiences" than anything else. My "after" photo was taken of me with my new summertime obsession... fishing! When I was heavy, you wouldn't have caught me out in the sunshine because I had more than enough "flubber" that it was just too hot. I recently went to Hawaii in November, 2012 and 1. bought my first bathing suit in about 20 years... 2. was seen wearing my swimsuit in public (there was NOOOO way before you'd find me in public)... and 3. snorkeled for the first time and I LOVE it! Thanks for reading and allowing me to share my experience with you!